Real Estate Agents are much more comfortable showing a home with a Realtor's sign instead of an FSBO sign. It is printed on both sides and has room for you to place your name and phone number on it if you choose. The dimensions of the sign are 18" x 24". It can be installed with a stake or hanging signpost. You are welcome to use a "For Sale By Owner" sign if you prefer. Sign not included in all packages. You may receive a sign that has been used and is not brand new. You may receive a sign made out of masonite wood or Corex. 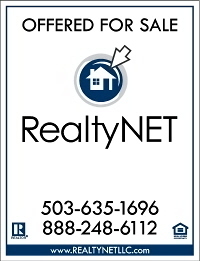 The custom version of our Realty Net sign is printed with our 800 number with an extension that will automatically forward live callers to your phone number. It will also have your MLS number printed on it with your custom URL that will route people directly to your webpage. For the techies out there, we print a QR (Quick Response) code on the sign so people who drive by with a smartphone can scan the bar code and get access to your webpage with all the photos and information about your home right on their phone. How awesome is that? The sign is made out Corex (vinyl) and 24" wide x 18" tall and will fit in most standard sign frames. Production of the sign cannot begin until the MLS number is assigned. Sign takes approximately five business days to produce. The attractive design and attention-grabbing colors make the sign easy to identify that your home is for sale when a person is driving by in their car. It comes with a large blank area for you to add your phone number. The custom version of our "For Sale By Owner" sign is printed with our 800 number with an extension that will automatically forward live callers to your phone number. 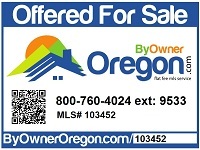 It will also have your MLS number printed on it with your custom URL that will route people directly to your ByOwnerOregon.com webpage. For the techies out there, we print a QR (Quick Response) code on the sign so people who drive by with a smartphone can scan the bar code and get access to your webpage with all the photos and information about your home right on their phone. How awesome is that? Place the directional signs at the main intersections to direct people to your home. Made of white Corex and matches the RealtyNET for sale sign. Place the directional signs at the main intersections to direct people to your home. Made of white Corex and matches the By Owner Oregon for sale sign. 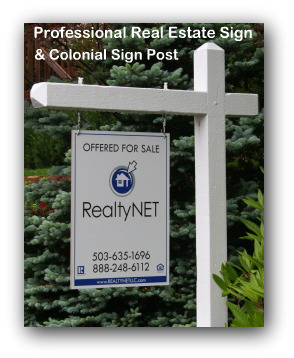 The Colonial signpost is a 4x4 wood post and stands 5 to 6 feet tall. It is professionally installed and picked up after the sale of your home or once the listing has expired or canceled. Colonial Posts are currently available in the Portland Metro area, Willamette Valley and most of Central Oregon.